Allow yourself an exploration of some of Uganda’s best camping sites as you engage in the stunning activities that will make you feel more enthusiastic about your safari. Parks to be visited include Murchison falls national park, kibale national park, Bwindi impenetrable and queen Elizabeth national park lake bunyonyi and Lake Mburo. Enjoy the magical rewards in Africa. Day 1: Pick up from the airport and transfer to camping grounds. Day 2: Transfer to Murchison Falls National Park. Day 3: Game drive, Nile launch cruise and hike to the top of the falls..
Day 4: Transfer to Fort Portal. Day 5: Chimpanzee trekking and Bigodi wetland walk. Day 6: Transfer to Queen Elizabeth National Park game en-route. Day 7: Game drive and boat ride along the Kazinga Channel. Day 8: Transfer to Bwindi Impenetrable National Park. 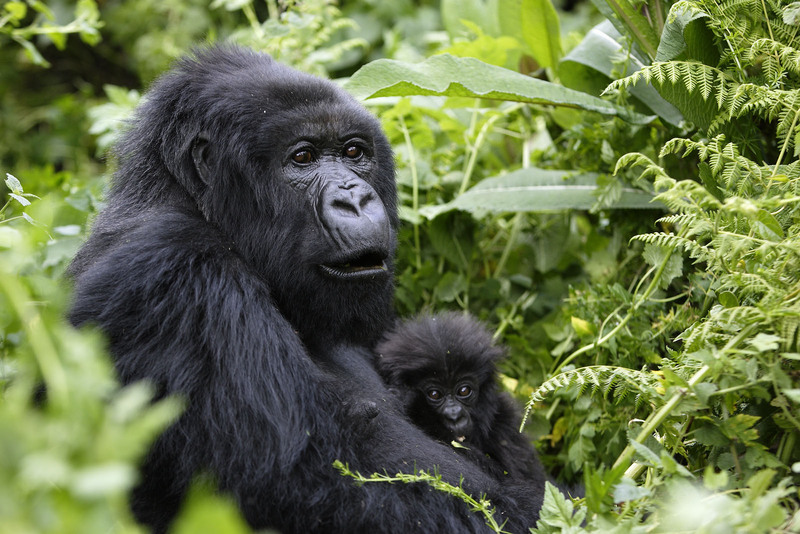 Day 9: Gorilla trekking and Community walk. Day 10: Transfer to Lake Bunyonyi. Day 11: Transfer to Lake Mburo National Park. Day 12: Morning game walk and Banyankole Community tour. Day 13: Transfer to Kampala. Day 14: Kampala city tour. Having arrived at Entebbe international airport in the evening you will meet and great you’re your safari guide that will then briefed about how your safari will run and then be driven to where you are supposed the night. When there you will freshen up dinner and overnight at Camping at Back Packers Hostel. Day 3: Game drive, Nile launch cruise and hike to the top of the falls. Wake up to a gorgeous breakfast treat and head for the briefing at the park headquarters before you head for the chimpanzee search while in the forest you will have company of the park rangers and n finding the chimps you will have an hour to view hour they feed paly and relax take as many pictures as you want to keep the amazing memory of the experience. After the activity you will head back for your lunch meal and in the afternoon hours head for the bigodi wetland sanctuary walk that Is also exciting and rewarding with great views of animals. There after head back for dinner and night relaxation at Primate Lodge Campsite or Kanyanchu River Camp. After your early morning breakfast you will drive to Queen Elizabeth national park the journey will take you about three hours as you have a scenic view of the Rwenzori Mountains. Have lunch en-route and take on a visit to the craft village to analyze how they are made and you could purchase some incase of interest.Driveon to Queen Elizabeth National Park, put up your tends and relax you can engage in the evening game drive to have sight of more game. After breakfast, embark on the transfer to Lake Bunyonyi passing through the Kigezi Highlands while there you will take on a boat ride to gain impressive views of Lake Bunyonyi with its. You also take a walk on some of the Islands to explore the heritage of the local people, their local schools, and their traditional food preparation methods, their traditional performances after all the activities you will head to the lodge for dinner and overnight camping at Resort Camp. Breakfast, then drive to Lake Mburo National Park which is about 199km that’s a 4 hours’ drive through the amazing landscapes of south western Uganda .on arrival in mbarara you will stop at Igongo Cultural Center for traditional lunchmeal. You will then proceed to lake mburo while there engage in the afternoon boat cruise along the lake there are possible sights of impressive Hippos, Nile crocodiles, avariety of birds specieslike the African Fish eagle and more. Then head to for relaxation, dinner and overnight at Wild Camping at Rwonyo. After breakfast, head on a stunning game walk as you pass through the fascinating savannah ecosystem and enjoying the game that is harbored there as you enjoy taking in the views and take pictures. While engaging in the game walk you will earn yourself an opportunity to sight game like the Rothschild giraffes, Impala, Burchell’s Zebra, Topis, Warthogs, waterbucks, bushbucks, and elands.Thenback to the lodge for relaxation, lunchafter which you will head for the Enyemebwa Cultural center to explore the exterior and interior of the local thatched huts, the views of the cattle Kraal, the crop gardens, and bananaplantations. You will enjoy a traditional performance before heading for dinner and overnight at Wild Camping at Rwonyo. wake and have breakfast, then the safari guide will take you through Kampala city with a visit to the few attractions in it inclusive of the Namuggongo martyrs shrine, the kabakas palace and the kasubi tombs the national museum among others. Head back to the hotel late lunch and then drive to the airport to catch your next flight.